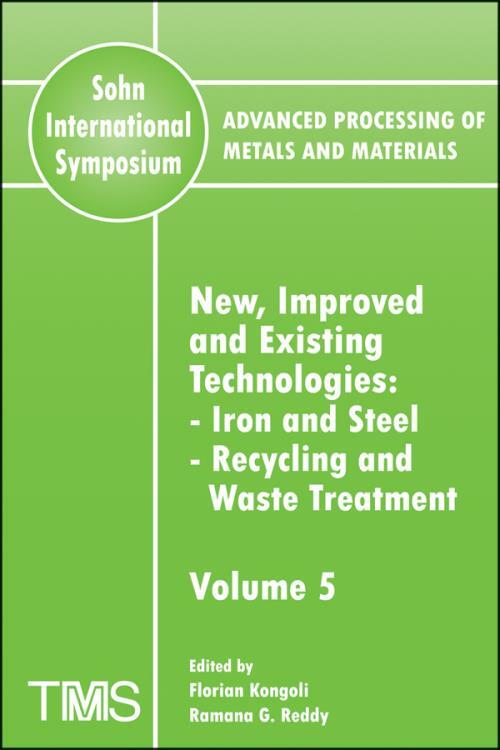 Some of the subjects presented in this volume from the Sohn International Symposium are iron making; steel; batteries, electronic scrap and light metals; waste treatment and remediation; and recycling and waste treatment. From the <a href="[external URL] target="—blank">2006 TMS Fall Extraction & Processing: Sohn International Symposium, held August 27 31, 2006, in San Diego, California. VOLUME 5: NEW, IMPROVED AND EXISTING TECHNOLOGIES: IRON AND STEEL; RECYCLING AND WASTE TREATMENT. Dust and Nanoparticulate Issues in Pyrometallurgical Operations (Keynote) (S.K. Kawatra). Coke Strength and Tuyere Velocity (Invited) (M. Ichida, T. Nishimura, S. Matsuzaki, and M. Naito). Process, Quality and Management Control in the Operation of a Direct Reduced Iron Plant (A. Ullah, B. Franco, A. Martinis, and A. Tavano). Pig Iron Nuggets Versus Blast Furnace Pig Iron (B. Anameric, and S.K. Kawatra). Experimental Analysis for Thermally Non–Equilibrium State Under Microwave Irradiations A Greener Process for Steel Making (Keynote) (M. Sato, A. Matsubara, S. Takayama, S. Sudo, O. Motojima, K. Nagata, K. Ishizaki, T. Hayashi, D. Agrawal, and R. Roy). Homogeneous Heating in Microwave Processing (X. Sun, J.–Y. Hwang, S. Shi, and X. Huang). The Evolution of Ironmaking (Keynote) (J.J. Poveromo). Development of the Coke Gas Desulfurization Technology (O.I. Platonov). Electromagnetic Processing of Materials, Past, Present and Future (Keynote) (S. Asai). Crystal Control of CdTe Electro–Deposits by Use of Intense Magnetic Field (T. Kozuka, I. Sumida, K. Shimomai, and M. Kawahara). Dissipation of Turbulent Kinetic Energy in a Tundish (A. Nßjera, and R.D. Morales). Modeling Dust Evolution in Electric Arc Furnace (EAF) Fume Extraction System (A.G. Guézennec, F. Patisson, P. Sessiecq, J.C. Huber, and D. Ablitzer). New Steel Production Technology with Microwave and Electric Arc Heating (Keynote) (J.–Y. Hwang, and X. Huang). Optimization of EAF Practices Based on Real Time Off–Gas Chemistry Analysis Using Goodfellow EFSOP (M. Khan, H.D. Goodfellow, and J. Maiolo). Potential Applications of Supersonic Liquid Streams (E.S. Geskin, and O.P. Petrenko). RECYCLING I: BATTERIES, ELECTRONICS SCRAP AND LIGHT METALS. Recupyl Process for Recycling Lithium Ion Battery (Keynote) (F. Tedjar). Processing of Spent Lead Acid Batteries A Basis for Lead Recycling (A.D. Besser, and V.M. Paretsky). Recycling of Spent Li/MnO2 Batteries (J. Jandová, and J. Kondás). Recycling of Spent Ni–Cd Batteries by Physical–Chemical Processing (C.A. Nogueira, and F. Margarido). Study and Development of the Physical Treatment of Spent Batteries in an Integrated Recycling Process (F. Margarido, and C.A. Nogueira). Utilization of Mn–Zn System Batteries (T. Lezhava, and J. Ghlonti). Efficient Processing and Utilization of Precious Metals Scrap (V.A. Bryukvin, T.N. Vinetskaya, A.M. Levin, T.A. Makarenkova, and V.M. Paretsky). Information Methods of Non–Ferrous Scrap Sorting (Abstract Only) (V. Bredykhin, O. Shevelyev, E. Kazban, V. Kostjuk, and V. Kushnerov). GENERAL RECYCLING AND WASTE TREATMENT I. Engineering Aspect on the Removal of As(V), As(III), Cr(VI), B(III) and Se(IV) with Functional Inorganic Ion Exchanger (Keynote) (J. Shibata, and N. Murayama). A Novel Green Technique to Recovery Titanium Compounds from Molten Slag Under the Dynamic Oxidation Condition (Li Zhang, Linnan Zhang, M. Wang, G. Li, and Z. Sui). Sampling of Fine Shredder Residues (FSR) and Characterisation Oriented to Physical Separations (P.–F. Bareel, D. Bastin, C. Bodson, and J. Frenay). Processing of Man–Made Metal–Containing Raw Materials in DC Electric Furnaces (G.S. Nus, and V.M. Paretsky). Chlorination Applied to the Separation of Metals (G. De Micco, F.J. Alvarez, A.E. Bohé, and D.M. Pasquevich). The CMI NESA Pyrolysis, An Attractive Process for the Treatment of Sewage and Industrial Sludge and By–Products (P.–D. Oudenne). Using De–Watering Sieve Waste of Borax to Enhance the Properties of Floor Tile (S. Kurama, A. Kara, and H. Kurama). GENERAL RECYCLING AND WASTE TREATMENT II. Electric Arc Furnace Steel Slags in "High Performance" Asphalt Mixes: A Laboratory Characterisation (Keynote) (M. Pasetto, and N. Baldo). Recycling of Platinum from Spent Catalysts (D. Offenthaler, J. Antrekowitsch, and S. Konetschnik). Separation of Individual Plastics from Mixtures by Gravity Separation Processes (W.Z. Choi, J.M. Yoo, and E.K. Park). Engineering Factors Affecting Removal of Toxic Materials with Inorganic Cation Exchanger (N. Murayama, and J. Shibata). Utilization of Refractory Brick Wastes in Concrete Production as Aggregates (T. Kavas, B. Karasu, and O. Arslan). Improvement of Technology for Processing Low–Grade Secondary Aluminum and Copper–Containing Raw Materials (Abstract Only) (V. Gel). Production of Reduced Nickel Powder in Tube Furnaces (P.S. Seryogin). Study on the Zinc Reduction of Stainless Steelmaking Dust (B. Peng, L. Chai, C. Zhang, J. Peng, X. Min, Y. Wang, R. Huang, and D. He). Autoclaved Aerated Concrete from Fly Ash and Effects of Fly Ash Composition (V.M. Rao and K.R. Kanth). Halide Entrapment from Polymers Using Alkali Compounds (Keynote) (Abstract Only) (S. Shuey, J. Montenegro, E. Vidal, and P. Taylor). Stabilization of Heavy Metals and Chlorine Removal in Municipal Solid Waste Incineration Bottom Ash by Carbonation Process (G.–C. Han, N.–I. Um, K.–S. You, J.–W. Ahn, and H.–C. Cho). Elimination of Heavy Metals from Municipal Inorganic Wastes by Chlorination Volatilization Method (Invited) (H. Sano, H. Kodama, and T. Fujisawa). Anaerobic Bioremediation of Metallurgical Wastes Using Organic/Water Emulsions (Keynote) (R.W. Bartlett). Chloridizing Volatilization Experiments for Treatment of Fly Ash Generated in Smelting Furnaces of Municipal Wastes (Keynote) (H. Itou, S. Watanabe, T. Takasu, T. Nakamura, H. Kubota, J. Ohashi, and K. Onishi). Lead Removal from Contaminated Soil by Sequential Application of Chlorination by Mixed Salt and Warm Water Extraction (F. Sato, H. Sano, and T. Fujisawa). Treatment of Zinc–Containing Wastewater by Immobilized SRB Sludge Beads with Inner Cohesive Carbon Source (X. Min, L. Chai, C. Zhang, and T. Okura). Purification of Waste Water from Ions of Heavy Metals (T. Lezhava, J. Gvelesiani, Ts. Gagnidze, and M. Mamporia). A Chlorination Process Applied to the Recovery of Alumina and SiC Reinforcement from Aluminum–Matrix Composites (A.E. Bohé, and H.E. Nassini).